Linear rail system comprises of 2 tracks and 4 guides which can we mounted and used mounted both horizontally or vertically. Light sliding panels and shutters. Anodised aluminium linear rails, nylon slides with metal threaded inserts. 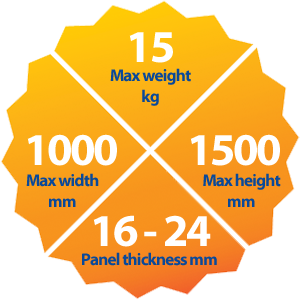 Kit suitable for 1 sliding panel upto 1000mm wide. Components can be bought as separate items.